In Fluid Bed Dryers, the product to be dried is fluidized by passing hot air through it. The process achieves fast heat transfer making it very efficient, yet gentle on the product, giving rapid drying of pharmaceutical/ fine chemical powders and particles. These Fluid Bed Dryers are of high quality and efficiency, in compliance with cGMP norms, built in stainless steel construction of 316 / 316L grade contact parts. 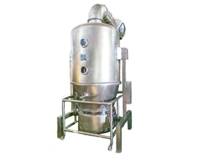 These Fluid Bed Dryers find application for drying powders, granular crystalline, coarse or similar material in pharmaceuticals, fine chemicals, dyes, food and allied products. In Compliance with cGMP Norms / guidelines. In Compliance with FDA regulations. Intrinsically safe Earth / electrical system generated due to static charge. 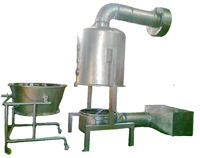 Kilolab Model to Production Models (10kg/batch up to 500kg/batch capacity). Validation documents provided like DQ, IQ/OQ, FAT/ SAT. All product process area of the equipment is in AISI 316/ 316L stainless steel, mirror polish. Pre air filtration module having 20 micron filters and secondary by 5 micron. Inflatable silicon seals for Product container / bowl and Finger bag filter. Excess Pressure Flap / relief provided. Pneumatic Product container lifting system. Automatic shaking of finger bag filters. Inlet/Outlet pneumatic dampers with control valve. Stainless steel and pressurized control panel. Heating options available are electrical/Steam/Thermic Fluid/LPG gas fired hot air heating system. Air filter assembly along with Heating system & Blower Unit to be mounted in remote area. HEPA (0.3 micron) / Absolute inlet air filter system. PLC based automation of process batch control, with printable option. Certified Flameproof Control / Operating Panel & Flameproof Motor for inflammable / solvent etc. Solid product Flow Monitor / detector to detect leak on filter bags to avoid material loss and air pollution. CIP/ WIP Washing in place units can be provided. Specially designed silencer for Noise level below 90 DB.